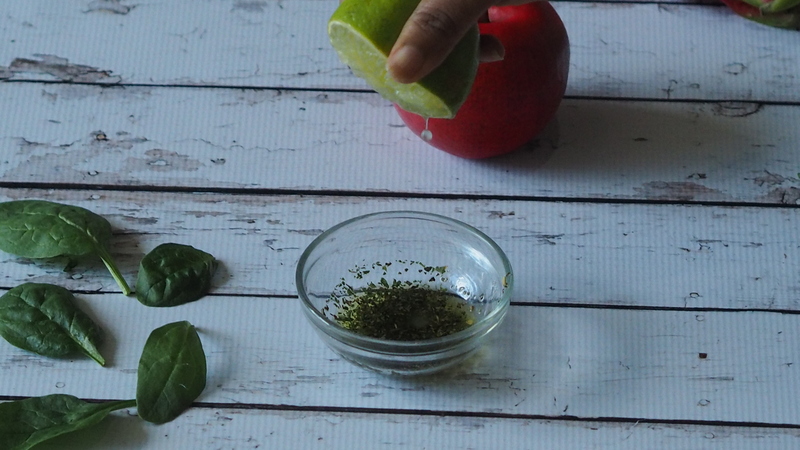 I never imagined simple ingredients can make such a huge difference till I tasted this salad. 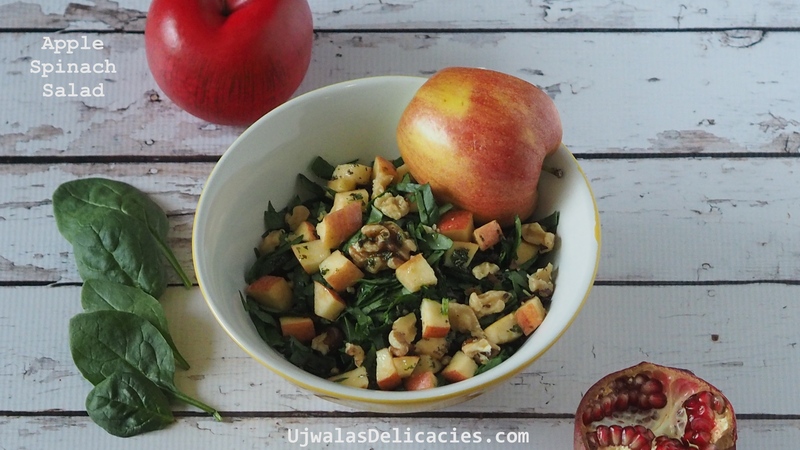 It is as simple as tossing together spinach, apple and nuts together. Chop some spinach, apples. Look inside pantry and fridge. If you see pomegranate or nuts or seeds use them as well. If you want to make it nut free, skip nuts and add sunflower seeds. Spinach and apples are available year-round. You have freedom make salad any time. Spinach is an excellent source of vitamin K, A and folate. Vitamin K is needed for blood clotting. Like most vegetables, spinach is low in calories, fat free, and a good source of fiber. Spinach is one of the most nutrient-packed vegetables and its raw form is an excellent source of chlorophyll. It is also a superb source of vitamins A, B complex, C, E, K, carotenes, folate, manganese, calcium, iron, iodine, magnesium, phosphorus, potassium, sodium, some trace elements and many valuable amino acids. An apple a day keeps doctor away. Apples are rich in antioxidant phyto-nutrients flavonoids and polyphenolics. The total measured anti-oxidant strength (ORAC value) of 100 g apple fruit is 5900 TE. Some of the important flavonoids in apples are quercetin, epicatechin, and procyanidin B2. Additionally, they are also good in tartaric acid that gives tart flavor to them. Altogether, these compounds help the body protect from deleterious effects of free radicals. Toss all salad ingredients in mixing bowl. Mix dressing ingredients in separate bowl. Whip till well mixed.